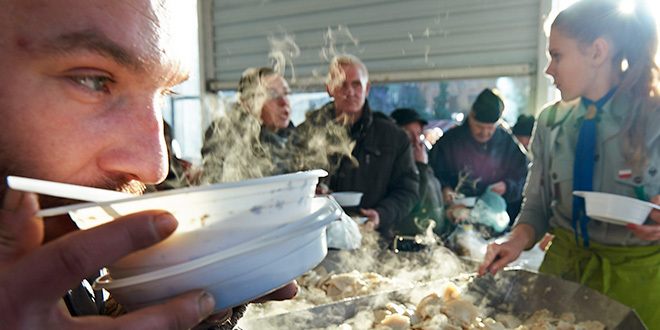 CATHOLICS have been encouraged to reach out to the poor – by an act such as sharing a meal – when celebrating World Day of the Poor on November 18. Pope Francis initiated World Day of the Poor on the 33rd Sunday of OrdinaryTime last year, and he held a Mass in St Peter’s Basilica, followed by a free lunch at various venues, especially for the poor. The Pope has called for a new evangelisation that prompts Catholics “to make tangible the Church’s response to the cry of the poor”. In a letter to clergy throughout Australia, Bishops’ Commission for Pastoral Life chairman Bishop Terence Brady encouraged all Catholic communities to be involved and respond to the theme of World Day of the Poor: “This poor man cried and the Lord heard him” (Psalm 34:7). The Pope’s 2018 message was signed on the feast day of St Anthony of Padua, the patron of the poor. Pope Francis said poverty “is not brought on by itself, but is caused by selfishness, pride, greed and injustice”. “His message contains a very practical suggestion: the sharing of the Sunday meal with the poor,” Bishop Brady said. The Holy Father has invited “priests, and in particular deacons, on whom hands have been laid for the service of the poor (Acts 6:1-7), as well as religious and the lay faithful – men and women – who in parishes, associations and ecclesial movements make tangible the Church’s response to the cry of the poor, to live this World Day as a special moment of new evangelisation”.